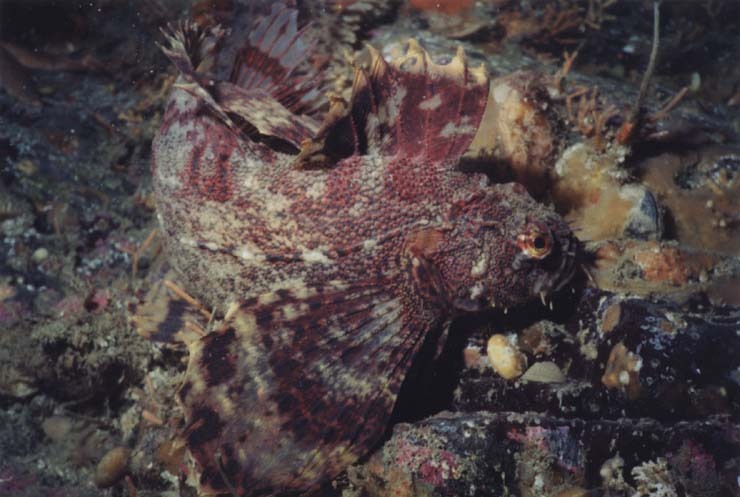 Despite a large local fishing industry, the fish are hard to find--we see sculpins, rockfish, greenlings, cod, flounder and a number of other truly beautiful and interesting fish, but they tend to be solitary and in hiding during the day. Schools of any kind are few and far between. Nevertheless, the local fish along with the nudibranchs, sea stars, sea cucumbers, shrimp, crab, octopus, sea lions, and sea pens make our diving more than worth the effort. For the first few years, most of our diving took place from the shoreline along the Juneau-Douglas road system. In April of 2002, however, we purchased a skiff to facilitate diving offshore. Getting further from the mainland is rewarded with better visibility and different critters and we've been thrilled with the sites we've found. While visibility here varies drastically depending on who you ask, (as it does anywhere), we typically log it as anywhere from two to forty feet. In the summer, the plankton blooms and the visibility diminishes; we've often been in water so opaque that we couldn't read the numbers on our gauges more than six inches away from our eyes This kind of water is fun to swim through, though, because it is often inhabited by swarms of tiny larvae. Luckily, descending through the murk usually allows us to get beneath the opaque surface waters until it clears up anywhere from thirty to seventy feet down. Above is a green cloud which blocks out much of the light, making some mid-day summer dives feel like twilight. In the winter, the water clears considerably but many of the fish common during the summer are nowhere to be found. The adult Steller's sea lions have returned from their breeding rookeries along the outer coast, though, so there are more of them around. One of their winter haulouts is on an island a few miles from the mainland along the northern extreme of the road system, so we often dive in that area to see them. Late winter, early spring is also the breeding season for many undersea critters so bundles of eggs are abundant and animals are releasing sperm and eggs into the water all over the place. The king crab breeding season, which takes place in relatively shallow water, is also a bonus in winter. For me, the greatest treat while diving here is interacting with the sea lions when they're feeling playful. Steller's sea lions are the biggest sea lions in the world--adult males average 1700 lbs., ten feet in length, while females average 600 or 700 lbs. and six or seven feet in length--and they're tan instead of the chocolate brown of California sea lions. Of course, the juveniles seem to be the most friendly ones. Sometimes they just buzz by and disappear, but at other times they've remained with us the entire dive, their numbers increasing all the while. One one memorable dive we played with seven lions at once who hung upside down and motionless in the water to watch us, turned graceful circles, dive bombed us, and even blew bubbles while (seemingly) watching for our reaction. At one point I was lying upside down on some rocks (just to do something different) with two sea lions zooming around and one hanging a foot in front of my mask and looking at me. This last one flew away for a breath but came right back, stopped, and watched again; I slowly reached out my hand in his direction and he laid his muzzle on it, just as a dog might, and let me scratch his chin for several seconds. Unfortunately, I was wearing gloves, but I could feel his smooth fur and thick, stiff whiskers through the rubber. Needless to say, I was thrilled! In fact, I count that as one of the happiest moments of my life. Some local divers feel no love for the sea lions because they can be aggressive and sometimes interfere with divers' activities. Many people in Juneau dive primarily to collect king crab or scallops and want nothing to do with big animals that sometimes tug on fins, bump divers, or otherwise intimidate comparatively clumsy people and make diving uncomfortable. No one, to my knowledge, has ever been injured by one around here and, the way I see it, it is their ocean, after all! Steller's sea lions have widely scattered spots on their fur. Most of them are not more than an inch in diameter though some can reach four or five inches across. I've begun trying to memorize obvious spots and patterns in the hopes of recognizing individual animals. One of the seven lions we dove with had a large spot in the center of his/her lower back. A month later we met this same individual (at least, I'm fairly certain it was) at the same place! Nudibranchs are another favorite to dive with, their bright colors flamboyant among the typically camouflaged sea life. It seems that we find a new variety every few dives and identifying them has become quite a challenge. Octopus are also fun, usually tucked in caves with one eye looking out and reddish legs with pure white suckers wrapped around their heads. At one wall we found a good sized crevice inhabited by a large giant Pacific octopus. We hung outside his home gazing at him for several minutes while he watched us from inside. After some time, his arms began to slowly waver and we thought he might be coming outside his cave to visit us; I put my hand on the lower edge of the crack in the hopes that he might brush against it on the way out. Instead only one arm was extended, in my direction, and he laid the last six inches on top of my hand from my fingertips to my wrist. A moment later he gently retracted his arm and returned to his quiet watching. Again, I was thrilled! Later at Adlersheim, a large octopus gave me a five-arm hug, the tentacles spreading out up my arms and around my head and camera, pulling me gently toward the cave. Interacting with animals like this is one of the great joys of diving. Southeast Alaska is also the northern home to humpback whales who feed on the krill and small schooling fish that thrive in the plankton rich ocean during the summer. Orcas, harbor porpoise, and Dall's porpoise live here year round. While I remain hopeful, I've never seen a cetacean of any kind from underwater in Southeast Alaska. I have been fortunate, however, to hear humpback whales vocalize several times. I keep gazing off into the green haze, just in case. Divers apparently feel the voices of whales vibrating the water when they are close. I got a Sea&Sea MX-10 underwater camera with a YS-40A strobe for Christmas 2000, so I've been able to capture a few of the fascinating things I've seen, (though I've also come home with a lot of fuzzy pictures and photos of half a fish). Despite the occasional frustration, I've thoroughly enjoyed my entrance into underwater photography and especially appreciate the added bonus of being able to identify many more of the creatures we see. I've been able to name ten times the life we've found once I had photos to use as guides. Below are some of my favorite shots from the Juneau area. All identifications are tentative--feel free to let me know if you have a better idea. If you can't tell what's in the photo, click for an enlargement and it should become clear; many of the critters around here are very well camouflaged. 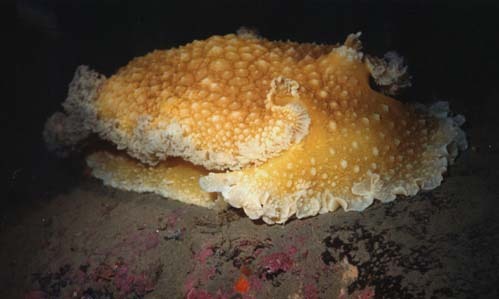 For more information about diving in the Juneau area, you are welcome to contact me at takudebbie@yahoo.com and our local PADI full service dive shop at http://www.thescubatank.com/.